Tonight at the Doug Fir, get your science fiction surf groove on courtesy of Man or Astroman and that’s not all. 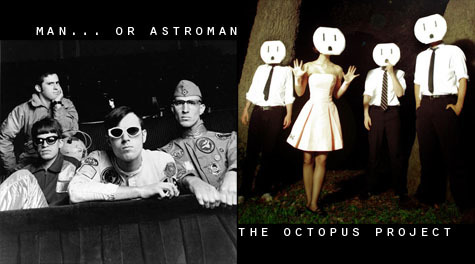 They’re playing with one of our current favorite bands, the Octopus Project. It’s sure to be a spaced out clam bake. Check out a few videos after the turn. EPM “gravity waves are a go” Out! If you were there, you know. Epic!